Dubonnet is an herbal fortified wine, similar to vermouth. Vermouths traditionally have wormwood to provide the main herbal and bitter component (although not as much now), whereas Dubonnet is a brand name of a quinquina, where the major flavor is cinchona bark. Cinchona provides quinine, which gives tonic water its bitterness as well. (There is a third category of “bitter” fortified wines, called americano, which uses gentian root for bitterness. They are often considered a sub-class of quinquina, as they will often have both cinchona and gentian root. Americano has nothing to do with America. Amer is French for bitter, as is amaro in Italian.) Dubonnet is considered a very mild quinquina, and as such it is a very easy drinker. I find it is also fruitier and lighter than a typical sweet vermouth. 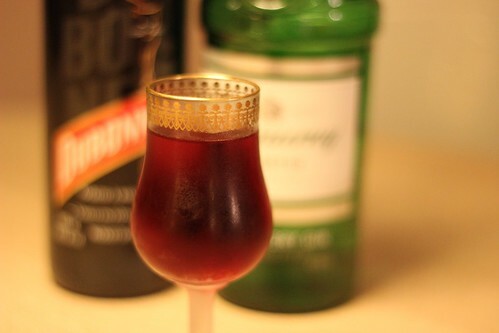 The Dubonnet cocktail is simply half and half Dubonnet with gin. It’s the same recipe in all three books. You’ll see different proportions in different recipes today, as people adjust to their taste for gin. The UK’s Queen Mother apparently preferred it with 30% gin and 70% Dubonnet, with a lemon twist. (Supposedly the UK’s Queen Elizabeth imbibes these every day before lunch.) Dubonnet came into existence in 1846 as a response to a French government contest to find palatable ways to get quinine into its soldiers. Given the quinine component, you can think of it as a more refined, French take on a gin and tonic. The Dubonnet gives it a slight sweetness and complexity but isn’t as strong as something like a sweet vermouth. This means the gin shines through, which isn’t a bad thing. Because the gin has a solid presence with the half and half, I definitely recommend using a nice gin you like. I used my standard mixing gin, Tanqueray, but I think I prefer it with Hendrick’s. Of course, you can also go all Queen Mum, and adjust it to your gin tastes as you like.